One of the great sights and sounds of a US winter, and a resultant mecca for wildlife photographers is the early morning and evening take-off and landing of the large skeins of Snow Geese that spend this time of year at Bosque del Apache Reserve in New Mexico state. Add in the over-wintering Sandhill Cranes roosting nearby and offering the same photographic opportunities in a location that is nearly always cold, clear and colourful at this time of the year and the photographic opportunities are clear – silhouettes, blurred mass take-offs, individual portraits: there’s something for all. With day time options including sunning Roadrunners, Coyotes, Mule Deer and colourful Meadowlarks and Quails before finding the best dusk silhouette opportunities to round off the day this trip offers a very full agenda and bags of colour and photographic potential, and the chance to be creative too! Day 1: On arrival at Albuquerque airport we will transfer to Soccoro (approximately two hours drive) for overnight accommodation, dinner and planning the next few days’ photography. Day 2: The pattern for our time in Socorro will be broadly similar to ensure we maximise the potential of this justifiably famous location. 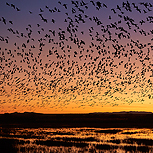 We will be visiting Bosque del Apache reserve well in time for dawn to photograph the snow geese taking off in their thousands – very spectacular and colourful with scope for a variety of photographic interpretations. 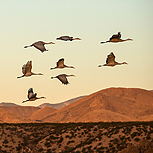 A short trip to the overnight roost of the sandhill cranes provides a similar take-off opportunity. After a well-earned American breakfast, the day will consist of resting for midday as the light can be harsh in this desert environment and then we head back to the reserve in the early afternoon for excursions around the reserve in search of roadrunners, coyote, kestrel, mule deer and individual geese and cranes before returning to the prime geese and crane locations for dusk shots as the birds leave their daytime feeding areas to head back to their favourite roosting area. The evenings give the opportunity for some photo critiquing, slideshows and general rest and recuperation. Days 3 – 7: We will follow the same pattern throughout the trip and work on images and at locations that we feel will benefit from more time and focus. The spectacular blast off by the snow geese is one of nature’s finest events but it can be tricky in capturing this spectacle in a still image so we will give it plenty of goes throughout our stay: there are lots of different approaches to capturing it too so we want as may opportunities to try them out as well. We could even change tack on some mornings and just concentrate on the sandhill cranes as they get ready to leave their roost, hopefully with some evocative mist hanging around. There are so many different styles and approaches to photographing here that although we are focussing on two main species , every day will offer different opportunities and the chance to push your creativity as well with plenty of help and encouragement from us too! Day 8: With hopefully one last dawn photo session we’ll return to Albuquerque for an overnight flight back to the UK which we will be arriving early on the following morning (8th December). The holiday exceeded my expectations. On my first visit, two years ago, the snow geese where only just arriving during the week. On this occasion, due to early cold weather in Canada, the geese arrived earlier and so where well settled at Bosque by the time we arrived. The early morning ‘blast offs’ where spectacular. Thanks to Ellie and Chris we were always in good positions for photographic opportunities. We had a variety of different scenarios which was great as it gave me the opportunity to attempt different styles of photography. Ellie is a very good guide and I learned a great deal from her. She has a very good ‘teaching’ style, a depth of knowledge and great photographic skills. I really appreciated how Ellie and Chris, pushed us out of our comfort zones, and provided us with the knowledge and opportunities to develop our skills. This was one of the best holidays I have been on as far as the guides providing us with opportunities to develop our skills and knowledge, proactively getting us to develop new skills etc and pushing us out of our comfort zones. The holiday was also a lot of fun, thanks to a good bunch of colleagues and a very nice atmosphere promoted by Ellie and Chris. Hard photographic work and fun, what more could one want. “All guides did their absolute best to ensure that we were getting the most out of all the photographic situations”. “We both learnt new techniques especially from Ellie who is very creative. I learnt a lot and as a result I’m much more proficient and confident in using my camera equipment than when I started the holiday. Accommodation, all meals, local transfers. Flights to/from Albuquerque, sundry items and alcohol. We will be staying at a clean and comfortable US style Motel, on a shared twin room basis (these rooms are American sized though so big beds assured!). Single supplement options available on request. All the walks around the reserve and the other sites we will be visiting are flat and relatively easy going. There will be early starts to be in place for dawn so the days but time for rest during the day will be available.